Eyebags, dark circles, wrinkles, and puffiness, these are just few of the eye problems that merits our attention. Whether you’ve had a complete rest or you stayed up the whole night, sometimes these unpleasantries just doesn’t go away. Often, even our famous cucumber and tea bag remedies no longer work. Dark shadows and puffiness along the lower eyelid always gives us the tired, haunted look that makes us seem stressed and older than we really are. The good news is, lower eyelid surgery, a very simple surgical procedure, can take away the number that our lower eyelids add to our real age. In some cases, the dark shadow is just a visual illusion of existing tear trough therefore once the tear trough is resolved through lower eyelid surgery, the shadow also improve. WHAT BENEFITS WILL YOU GET FROM LOWER EYELID SURGERY in Thailand? Lower eyelid surgery in Thailand is done to remove excess skin and erase fine wrinkles on the lower eyelids. Excessive puffiness can also be corrected by this surgery as some fat deposit on the area may also be removed. Dark circles may not be completely addressed as a combination treatment of laser and topical ointment may be prescribed depending on the degree of pigmentation. With the lower eyelids rejuvenated, the gaunt look that you usually see in the morning as you wake up or at night after your day’s work will be remarkably improved. Though some cases may also require additional procedures especially for those with more severe signs of aging, lower eyelid surgery brings a lot of difference in your overall appearance. HOW IS LOWER EYELID SURGERY in Thailand DONE AND WHAT ARE THE RISKS INVOLVED IN THE SURGERY? Lower eyelid surgery in Thailand is typically a 1-hour procedure done under local anesthesia. It is considered minimal invasive with very little to possibly no down time. Like other surgeries however, the chance of scarring is possible with the external incision though most of the time, incisions sites heal well for this type of surgery. 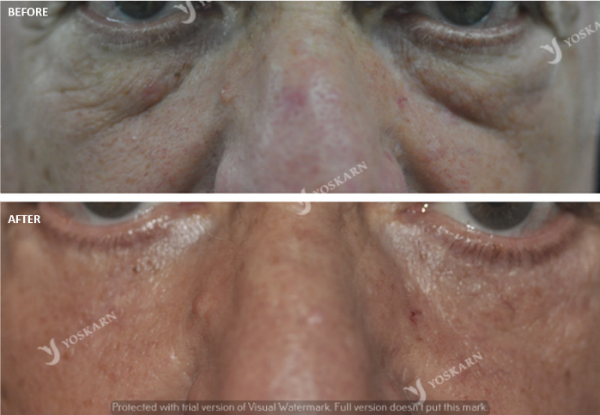 In cases where a combination of bags of fat, excess skin, and loose muscle is present, external incision immediately below the eyelashes may be required. With this technique, there may be some discomfort following surgery since the incision will be along the lower eyelid margin but our surgeon will make sure the sutures will never be in the way of your sight. For those with only bags of fat without excess skin, laser assisted transconjunctival technique can be used. This will involve using laser to extract fat out from inside the conjunctiva without any external incision. No sutures will be used and there is very minimal to no swelling and bruising afterwards. The technique also cuts the surgical time in about half the traditional approach. Since there will be no visible incision, there will definitely be no scarring as well. HOW LONG IS THE RECOVERY PERIOD FOR LOWER EYELID SURGERY in Thailand? Like upper eyelid surgery in Thailand, there is very little to no downtime for lower eyelid surgery. Swelling and bruising will be at maximum for the first 48hours then it will gradually subside. Ambulation is encouraged to promote better circulation and faster healing but enough rest is also highly recommended. Dissolvable sutures are usually used for lower eyelid surgery so no suture removal is required for follow up checkups. Though patients can go back to their country in as little as 1-2 days after surgery, we still encourage staying for a couple of days so our surgeon can monitor the healing of the incision site. As with other eyelid surgery procedures, post-operative patients are advised to wear proper protection for the eyes following surgery to avoid infection or irritation. Wearing dark sun glasses will also help protect the site from sun damage due to sun exposure. Aside from world class surgeons and medical team, our clinic also offers a whole package of accommodation from our nearby hotel, Aphrodite Inn, which sits adjacent to our facility with a connecting door on the 2nd floor for patient privacy. The 2nd floor of Aprodite Inn was also converted to suit the needs of our patients, pre and post-operatively. Each room is equipped with mechanical beds, with hotel quality mattresses, and oxygen outlet for patients who just had surgery. Medical equipments and emergency apparatuses are also within reach from the rooms so there will be no need to worry about recovery.